Growth Habit: A large tussock forming grass growing from 1 to 3 metres in height. Pampas can grow into large impenetrable clumps measuring many metres in diameter. The flower spike is clearly visible in season. The grass blades are very abrasive to the touch. Type of Plant: Perennial grass. Plants usually flower in their second year. Flowers: Large , silky, white to pink spikes. Flowering time depends on species type. Fruit/Seed: Pampas seed is particularly hairy and readily dispersed by wind. Each female plant can produce up to 100,000 seeds per flower head. Dispersal: Wind can carry seed over 25 kilometres from the mother plant. Distribution: Pampas is widespread through out Tasmania. In the past it has been planted as an ornamental and in hedges as windbreaks on rural properties. When it occurs as seedlings in pasture it is readily grazed by stock. It is now spreading along roadsides, into wastelands, bushlands and forest areas. Status: Pampas is a Declared Secondary and Prohibited weed. Where possible land holders must eradicate these plants. As a Prohibited weed it is illegal to transport or propagate pampas. Pampas is extremely invasive, rapidly colonising areas such as drains, firebreaks, road edges, logged or burnt sites and quarries. It has already established itself in both pine forests and eucalypt regeneration areas and in national parks. Once established in the under-story, pampas is capable of completely smothering all other plants creating dangerous fire hazards. Pampas is capable of producing up to 56 tons of dry matter per hectare over a three year period. 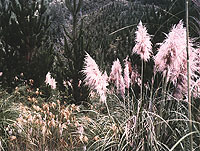 Where the removal of the complete pampas plant is not immediately possible, the flower heads should be removed and burnt as soon as they appear. Pampas can reshoot from root and shoot pieces. For this reason it is also a prohibited weed and plant matter must not be transported or dumped. Pampas Varieties: The original Pampas in Tasmania was the white flowering kind. It was vegetatively propagated from female plants. Seeding was not a problem due to the absence of male plants and pollen. Pampas became popular as a windbreak and fodder plant throughout Tasmania. Recently seed has been imported to satisfy consumer demand. This seed contained both male and female plants. The original pampas is able to hybridise with the newer arrivals creating an enormous potential weed problem. All pampas , regardless of the colour of the flowers should now be removed. Similar Plants: Some of the native grasses such as cutting grass can look similar to Pampas, however there is no mistaking the striking Pampas flower heads for any other plant. Grazing (May – Nov). Grazing, grubbing or slashing needs to be done when there are no seed heads present to stop the spread of seed. If present, seed heads should be removed first. With grubbing, removal of all rhizomes as well as the crown is required as rhizome fragments and the crown can quickly re-establish. Seedhead Removal (Nov – Mar). If seed heads are present, remove them by cutting before further control measures. Seed heads should be burnt after removal. Removal of seed heads can be done each year over the flowering periods if the plant is being used as a wind break or for fodder conservation. Spot Spraying (Aug – Feb). Herbicides to be used on Pampas are: Glyphosate 360g/L products at 20ml/L as a foliar spray. A surfactant should be added. Glyphosate can also be through a wiper applicator using a concentration of 1 @ 360g/L product to 2 parts water. Large clumps may first be burnt or cut then allowed to regrow prior to foliar spraying. Hexazinone (Velpar LR) applied by spot gun at 3-4 ml per large plant. Glass selective herbicides such as Verdict R, Sertin R and Fusilade R are reported to be effective against Pampas. Education (all year). Further public awareness is required of the threat Pampas is to our forestry industry and our reserved areas.